Sitting on the Laos side of the border as the sun is about to set. 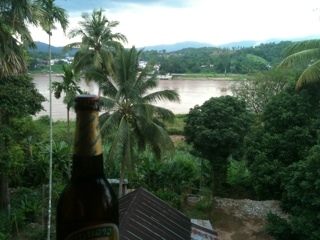 Looking at Thailand and the bordering Mekong river enjoying a Beer Lao, which is pretty good. Life is good. Try the dark Beer Lao. We tried it last night — delicious! 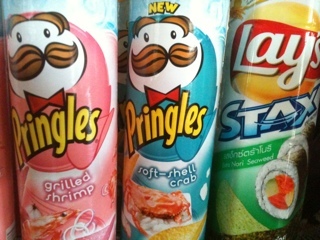 Some new flavors I haven't seen before. Mmm?